Since June, the federal government has been operating a massive tent city in the West Texas desert to detain immigrant children who have traveled to the United States seeking protection from persecution and abuse in their home countries. Last week, I visited the Tornillo detention camp with colleagues from the ACLU of Texas. There are currently over 1,000 unaccompanied immigrant kids at Tornillo, most from Central America, who were transferred from long-term shelter placements. They’re presently waiting to be reunified with family members or other sponsors while their immigration cases move forward. The sprawling detention camp has the capacity to detain up to 3,200 children. Federal law prioritizes the best interests of the child. In the case of immigrant minors, that means prioritizing reunification and placing children in the least restrictive setting possible. Typically, these children are transferred from Department of Homeland Security custody to shelters across the country run by the Office of Refugee Resettlement, where they wait to be reunified with family members or other sponsors while their cases move through the immigration courts. The Tornillo detention camp represents a major shift in the policy and practice of putting the best interests of the child first. It is an outgrowth of a crisis manufactured by the Trump administration to terrorize immigrant communities and restrict legal options for people seeking protection in the U.S., including children. A recent agreement between U.S. Immigration and Customs Enforcement and ORR now requires background checks and fingerprints — not just for potential sponsors of immigrant youth but for any person living in the same household as sponsors — that can then be shared with ICE. The effect is to instill fear of arrest and deportation in those who come forward to sponsor a child. This change in policy has created major obstacles for families and delays in the reunification process, in some cases increasing the time a child spends in detention. Some of the kids told us they had already been at Tornillo for a few months. One 16-year-old girl told us she is from Guatemala and was detained in a shelter in New York before she was transferred to the Tornillo camp in July. She said she had no idea how much longer she would be there but she wanted to be reunified with her family. Nearly all of the girls in the group I spoke with said they were waiting for “huellas” — fingerprint clearances of their sponsors and households. Officials told us that approximately 600 of the kids at Tornillo were waiting for such background checks. The Tornillo camp was built from the ground up in the middle of the desert over the summer. It is a sprawling site that backs up to a border fence marking the boundary between the U.S. and Mexico. There are khaki-colored tents lined up in rows with plastic orange cones and temporary fencing, creating makeshift streets and sidewalks. There are about 20 boys to a tent who sleep on bunk beds. 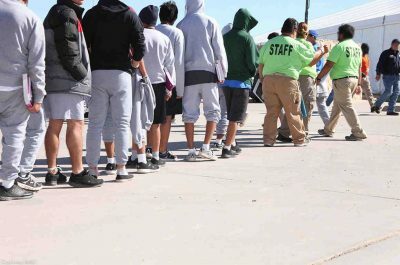 There are about 200 girls detained at Tornillo in a large white tent that serves as a dormitory, as well as a multi-purpose room where they have their meals and some activities, including a few hours of education per day — which were implemented after scrutiny by advocacy groups. The tents are “soft-sided.” They are not insulated, but rather cooled and heated through an external unit that blows air into the tent. They have no natural source of light. The camp does not have a plumbing or sewage system, so all of the water and waste is hauled in and out of the camp. When there’s a lightning storm, common in the desert especially during the summer months, the kids use plastic, stand-alone portable toilets to avoid the risk of electrocution from using the facilities in the metal trailers. Like many immigration detention facilities, the Tornillo detention camp is in a remote area, far from public scrutiny and where legal services are very limited. This is troublesome when those detained are asylum-seeking children who need access to attorneys, social workers, medical care, and community support. ORR contracts with BCFS, a San Antonio-based nonprofit contractor that provides emergency management services during natural disasters and humanitarian crises. During the tour, officials told us they hauled in everything to set up the detention camp, from the gravel to the generator-powered electricity and portable toilet and shower trailers. The cost of detaining a child at Tornillo is estimated at $700 per day per child. This amounts to millions of dollars each month to advance the Trump administration’s cruel agenda targeting vulnerable migrants who are seeking protection and — in the case of immigrant youth like the kids at Tornillo — reunification with their families. Detaining children, especially in these conditions, is certainly not in their best interest. It creates immediate risks as well as long-term physical and mental health consequences. Especially considering that many of these children have family members or sponsors waiting to care for their safety and well-being, the government’s insistence on warehousing them at Tornillo is a moral disgrace. Victoria López is Senior Staff Attorney at ACLU National Prison Project. Featured image is from HHS.